There’s nothing Christmassy about Frost at Christmas apart from the title and the fact that it is set just before Christmas. Ten days to Christmas and Tracey Uphill, aged eight, hasn’t come home from Sunday school. Her mother, a pretty young prostitute, is desperate. Enter Detective Inspector Jack Frost, sloppy, scruffy and insubordinate. To help him investigate the case of the missing child, Frost has been assigned a new sidekick, the Chief Constable’s nephew. Fresh to provincial Denton in an oversmart suit, Detective Constable Clive Barnard is an easy target for Frost’s withering satire. Frost at Christmas has been on my shelves for over 2 years. It’s the first of R D Wingfield’s DI Jack Frost series. Years ago I’d watched the TV series with David Jason as DI Frost, which I thought were interesting but I wasn’t that keen on Frost as a detective. So I was surprised to find that the book and the character are so much better. Frost at Christmas was first published in Great Britain in 1989, but Wingfield had written it years earlier, in 1972 and it was first published in Canada in 1984. In his obituary in The Guardian Wingfield is quoted: “I have nothing against David Jason as Frost at all, he just isn’t my Frost.” He liked Jason as a comedy actor in such vehicles as Only Fools and Horses, but felt that along with the choice of actor had gone a softening of the dark humour essential as a safety valve for policemen investigating horrendous cases. After reading Frost at Christmas I agree: David Jason’s Frost is not my Frost either. He’s a much tougher character, not at all PC. but he is much more than the crude, sexist and insensitive rude person he first appears. Of course he is unorthodox, which doesn’t go down well with his boss, Superintendent Mullett who is the exact opposite of Frost, being always immaculately dressed and supremely oblivious to Frost’s excellent detective skills (as in the TV version). He doesn’t obey orders, goes off at a tangent and doesn’t like experts who rely on precision, whereas he uses his hunches and intuition. Frost is popular with his colleagues, although they are less than happy when he is late handing in their expenses claims. There are several storylines – the missing schoolgirl, a bank robbery and the discovery of a three decades old murder plus other more minor crimes. It’s a reminder of the time when people smoked and held meetings in blue-fug filled rooms, and when there no mobile phones and people used public telephone boxes. I liked Frost’s sense of humour and the way his relationship with the new DC, Clive Barnard, the Chief Constable’s nephew develops. Clive after seeing Frost as incompetent and disgusted by his ‘cheap gibes’ eventually sees the other side of his boss as he learns what lies behind Frost’s tough facade and a bit about his history, his wife dying of cancer. I think Frost at Christmas is so much better than I expected. 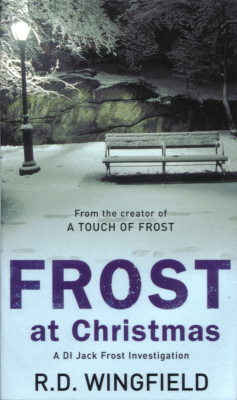 I really enjoyed it and am going to read the other five Frost books R D Wingfield wrote. Reading Challenges: Mount TBR Challenge, Vintage Mystery Scavenger Hunt – in the Silver Age category of ‘photograph’. It’s nice to be pleasantly surprised by a book, and even nicer to have a new series to dive into over time. It does sound like a grim story, despite the time of year setting. Also, it is interesting to read books set before the deluge of cell phones–plots that used to hang on needing to find a phone are a thing of the not so distant past! I had almost totally the opposite reaction to this one. I loved the TV series (still can’t resist the repeats) and when I read the book I couldn’t accept the Frost in it – he was so obnoxious in comparison to cuddly David Jason. I did wonder at the time if my reaction would have been different if I’d read the books first. Maybe I’ll try again some day – once I stop watching those repeats! I’m glad you enjoyed this one, Margaret. And your comparison of the book to the TV adaptation is a good reminder of how important the nuances of character are . I think adaptations are so much better when the protagonist’s character is really reflected by the actor.